Just 70 miles west of the island of Key West lies the Dry Tortugas, a tiny grouping of islands that were discovered back in 1513, two decades after Christopher Columbus sailed the ocean blue and discovered the West Indies. Spanish Explorer Juan Ponce de Leon was the first to step foot here, and he pointedly named this beautiful place, Tortuga, after the abundance of loggerhead turtles he found here. The Spanish eventually sold the islands to the Americans for $5 million, and sometime in 1824, five years after the sale of Florida, David Porter, U.S. Navy Commodore came to the Dry Tortugas with the idea that a naval site needed to be built here, but upon his return to the mainland, he reported that this collection of islands was virtually useless. The climate was harsh, the natural resources scarce and there was little land to built anything significant other than a lightouse. Garden Key became the site of the historic lighthouse, and construction began in 1825 and was finished in 1826. Ship captains now had a means to navigate themselves away from shore, but there was still no command post to regulate the amount of piracy occurring in the region. 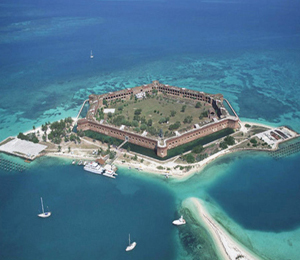 In 1829, John Rodgers, an American Commodore decided that the Dry Tortugas, contrary to his colleagues observations, would in fact make for an ideal location for a post, and thus Fort Jefferson was born. Today, Fort Jefferson boasts the title of being the largest masonry structure in the Western Hemisphere. It is said that some 16 million bricks make up this towering fortress, and the labor that went into its construction is unimaginable. The fort itself was originally designed to be a gargantuan gunnery platform, with the capabilities to destroy enemy vessels from both a long and short range. A laborious army of stone masons, blacksmiths, speciality carpenters, civilians and general laborers descended upon the tiny island to bring the vision to fruition. And with most impressive structures constructed in the south, the use of black slaves was prominent. Fort Jefferson also served as a military prison, and after a while, the prison population was substantial enough to help with the construction, dismissing black slaves. The population of Fort Jefferson peaked somewhere around 1,729, however, by the tail end of the American Civil War, the population had plummeted to 1,000. With half of them being soldiers who had been accused of dissertation. Not all prison guests were so anonymous, as the Fort Jefferson was once the home to the men convicted of conspiring to kill President Lincoln. In 135, President Franklin D. Roosevelt, designated Fort Jefferson as a National Monument, which is why you can visit the perfectly preserved historic site today. If you are vacationing in Key West and want to explore the more historical side of the region, hop aboard the Yankee Freedom Dry Tortugas Ferry. The journey here is as spectacular as the destination. Everywhere you look is postcard perfect, and there is no other time in your life when you are going to have the opportunity to explore the largest stone structure in the Western Hemisphere! The history of Fort Jefferson is long, and rich, and with all the colorful characters who once called these prison walls home, this will be one of those bucket list items you won’t want to miss.